Captain New Eyes travels back in time and feeds dinosaurs his Brain Grain cereal, which makes them intelligent and non-violent. They agree to go to the Middle Future (our era) in order to grant the wishes of children in New York city. They are to meet Dr. Bleeb of the Museum of Natural History, but get sidetracked with their new children friends and run into the Captain's evil brother, Professor Screw Eyes, who has other plans for the dinosaurs. A scene in which Prof. Screweyes cages and chains the dinosaurs was fully animated, but ultimately cut from the movie on the grounds that it was too intense. Shots of it can still be seen in the original trailer. Factual errors: The Macy's Parade is going in the wrong direction. Rex: I'm Rex. What's your name? Louie: I think it's Louie, but seeing you guys is giving me doubts about my brain. Kids, Dinosaurs, a Parade...It just can't lose! 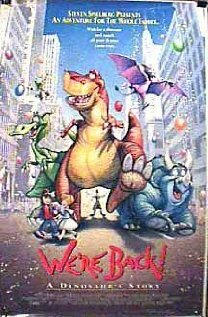 The basic plot: Four dinosaurs (made more intelligent by a kindly scientist) are given the chance to delight children by coming into the future to live with Dr. Bleeb at the Museum of Natural History. Why it works: Kids love dinosaurs (especially big cuddly talking ones that sound like John Goodman), kindly scientists, time travel, and (when given the chance) Natural History. The animation is good quality, the basic premise is fun, the music (with a surprise by Thomas Dolby) is good and well placed (no one bursting into an annoying song every 30 seconds) and the voice talents are wonderful, featuring well known actors such as Martin Short and Rhea Perlman, voices we know from elsewhere--Walter Cronkite and Julia Child, and veteran Voicers Yeardley Smith (the unsinkable Lisa Simpson) and the remarkable Charles Fleischer (Roger Rabbit). Some characters needed a little more character...a little more explanation (such as Professor Screweyes--who went mad and turned evil because he lost his eye--??). But hey, this is a kids' movie, right? Let it slide. Will kids' like it? Absolutely. And the adults? Relax and have a good time, and try not to think too much.